Smokey Robinson is a legendary singer, songwriter, and record producer whose contributions to music has led him to be inducted into the Rock and Roll Hall of Fame in 2012 and the Rhythm & Blues Hall of Fame in 2016. Robinson made a name for himself as part of The Miracles before going on to become a music executive at Motown Records. Smokey was born William Robinson Jr. to Flossie and William Robinson Sr. on February 19, 1940, in Detroit, Michigan, U.S. His parents are of mixed black and French ancestry. While growing up, Smokey witnessed firsthand the harshness of life having been raised in a rough neighborhood in the North End area of Detroit. In order to give himself a chance at a better life, Smokey worked hard in school and excelled both in his studies and as an athlete. He also had a passion for music which led him to create the group The Five Chimes in 1958. The Five Chimes comprised of Smokey Robinson, Ronald White, Pete Moore, Bobby Rodgers, and Emerson Rodgers who was later replaced by Claudette Rodgers. In 1957, the group changed its name to the Matadors and by 1958, they welcomed guitarist, Marv Tarplin. By this time, the Matadors had gained some local fame and began touring their city, performing at different clubs and venues where they were given a chance. They, later on, changed their name again, this time to The Miracles. While touring and seeking a recording contract, the Miracles met record producer Berry Gordy Jr. who was impressed by Smokey’s vocals and his songwriting ability. Gordy went on to help the group put together their first single titled “Got a Job”. Robinson was at this time attending college where he was pursuing a degree in electrical engineering. He, however, later dropped out after his group got a contract with Motown Records. The Miracles’ first big hit under their new label was the song “Shop Around” which was released in 1960. The hit song went on to become Motown’s first million-selling record and helped the group develop a cult following. From then, Smokey Robinson, who served as lead singer, songwriter, and producer, did not look back as he and his group released more than 20 songs that made the Top 40 hits. They include songs like “You’ve Really Got a Hold on Me”, “I Second That Emotion”, “Baby Baby Don’t Cry” and the number one hit, “The Tears of a Clown”. Outside his group, Robinson wrote and produced songs for his other label mates, most notably The Temptations, Mary Wells and Marvin Gaye. His work directly contributed to the success of Motown Records and helped enshrine him as the godfather of soul music. He went on to become Vice President of Motown Records before calling it quits with the group in 1972. He continued to serve as music executive but after having spent a year on the sidelines, Smokey made a comeback, releasing over 20 bodies of work as a solo artist between 1973 and 2005. In 1988, he won his first Grammy Award for the song “Just to See Her” from the album ‘One Heartbeat’ which was one of his most successful albums ever. Smokey Robinson is said to have an estimated net worth of $100 million dollars which he has amassed over the course of the 50 plus years he has spent in the music business. Read Also: Who is Spike Lee? What is His Net Worth, Age, Height and Family Life? 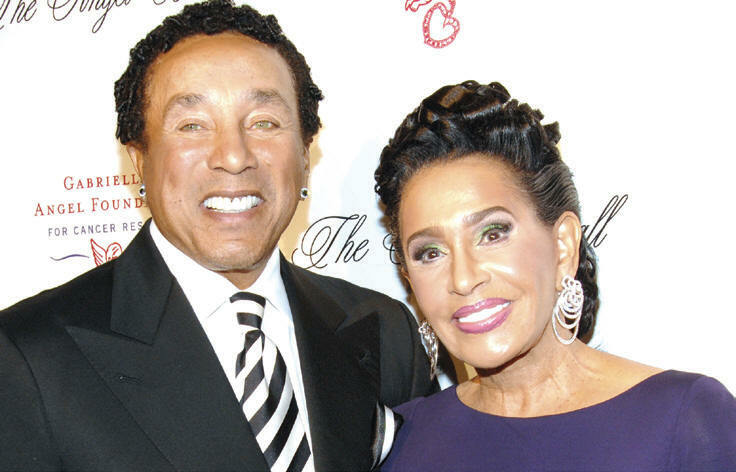 Smokey Robinson is currently married to fashion designer Frances Glandney. The couple got married sometime in 2004 and has since lived their lives together although they do not have any children. Smokey himself has three kids; son Berry Robinson, born in 1968 and daughter Tamla Robinson, born in 1969 from his first marriage to former Miracles bandmate, Claudette Rogers. In 1984, he had a son, named Trey from an extramarital affair that led to the collapse of his marriage with Rogers. It is not clear if indeed Smokey Robinson is gay or not. The talented musician has always appeared in public with women and has never alluded to having loved any man in the past. However, we would not be surprised to hear that Smokey might have been with a few men in the past. Smokey Robinson is still very much alive. The “You’ve Really Got a Hold on Me” singer was however falsely reported to have died in 2017 in what was said to be a bizarre lawn mower accident that involved a rabbit.